History: Aedammair, more commonly Addie, was born on a farm near the outskirts of Dublin, the second of three children. As a farm girl Addie spent much of her childhood working with livestock, mostly cattle, and riding her horse around the farm. Growing up she had no idea she was a mutant until her powers manifested at the age of 12 during a particularly stressful moment of a gymnastics tournament. After a slight falter on the uneven parallel bars, she became overwhelmed by stress and suddenly found her hands surrounded by pulsating green radiation. Having mistaken the girls radiation for fire, the papers nick-named the girl Ã¢â‚¬Å“The Emerald Flame,Ã¢â‚¬Â which would stick with her for years. The resulting fallout from her power use turned much of the town against her and forced the young girl to seek refuge, eventually finding it at Claremont. The young Irish women flourished under tutelage at the academy, not only learning to control her powers, but mastering the art of gymnastics and itÃ¢â‚¬Ëœs applications to combat. At the age of 14 she first met Waterbug, who would spend most of the next 3 years wooing her. They would eventually be married on graduation day from the Acedemy. The two would remain married for little over two years, divorcing shortly after Addie discovered IanÃ¢â‚¬â„¢s secret life as a hitman. Having no where else to go, Addie enrolled in Freedom City University as a chemistry/education double major, occasionally taking study breaks to patrol the campus for crime. Shortly after graduation she moved home and took a job at an elementary school. There was just one problem. She was bored. Remembering the days when she was used to use her powers got her thinking of moving back to Freedom, and so, at the age of 24, she did. Addie borrowed a bit of money from her parents and moved into a nice, if small, apartment in Midtown. Addie was luckily able to get a teachers aid position at a midsize private school within walking distance. With her new life set up, it was time to return to the world of supers. On her first foray back the newly rechristened Emerald Flame thwarted a convenience store robbery as the robber ran past the alley way she was cutting through. After subduing the man, Addie realized that was what she had missed, the fighting, the primal rush of testing herself against others in combat. Her quest for glory began. Soon after her return to Freedom City Addie spotted a vague ad in the classifieds job section. Answering the ad lead her to Ã¢â‚¬Å“The ArenaÃ¢â‚¬Â where a man she has never been able to recall correctly gave her the information about the job; taking out Lady Liberty. Though Addie failed in her attempt, it was this experience that solidified her love of battle. She is now a professional enforcer, working for whoever contracts her. In defiance of expected behavior, Addie will not switch sides if someone offers her more money. The money is of no consequence. She doesnÃ¢â‚¬â„¢t want to draw suspicion for being a teacher with a six figure income, and as such rarely spends or even keeps her payments. ItÃ¢â‚¬â„¢s all about the battle. Addie has changed her name and costume to better reflect her love of battle and to avoid tipping off her old classmates. 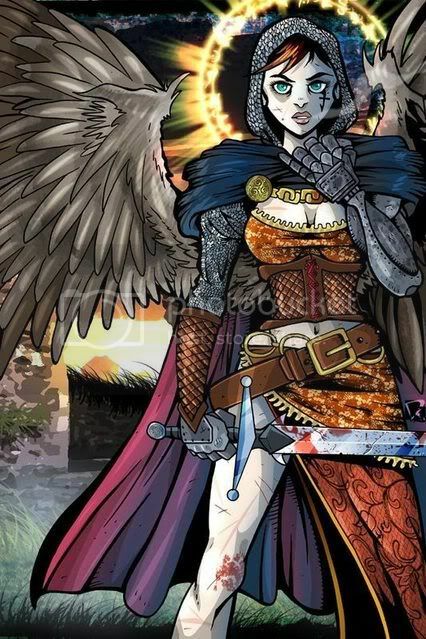 She has chosen the name Badb, a Celtic war goddess who delighted in battle. Her costume consists of an ornate Celtic Knot top, brown battle skirt and a pair of gray wolfskin fur anklets. She is often barefoot. In deference to her namesake, Addie has crows wings sewn onto the shoulders of her costume. Strength Level: Badb is of the normal strength for a woman her size and weight who engages in regular strenuous exercise. Known Super Powers: Badb can generate and project blast of radiation. These blast are capable of melting most metals. By focusing the energy in her body, Badb can achieve flight. Abilities: Badb is an Olympic level gymnast. Whew. I have double and triple checked this build, rebuilt it to one extent or another about 4 times and finally here we are. My tradeoffs are as follows: -2/+2 for Attack/Damage. +2/-2 Defense/Toughness. I'm really hoping I didn't mess up here. But that's what this thread is for I suppose. For those in the chat earlier, this is the villain I was considering making a spear wielder. I made the build but could not for the life of me come up with a background that I even remotely liked. Probably because I already had the radiation user background built, and thus there is a mental block there. I solved the "should use a spear" dilemma by giving her a different, and slightly more appropriate, war goddess's name. Well, technically a more specific aspect of the same goddess. Dang triune. Enjoy. PM me if your interested in the spear user stats. They came out pretty cool. 1. It looks like you bought 6 ranks of BAB and 8 ranks of BDB (28 PPs for combat). If that is the case then your defense bonus flat-footed isnÃ¢â‚¬â„¢t +8; it is +4. When you are flat-footed, you looks all of you dodge bonus, and Ã‚Â½ of your BAB is considered dodge (along with all of the ranks of Dodge Focus). Is the AP Dazzle also Improved Range and Incurable? Other than those two clarifications, everything looks good. 1. I know, I was trying to follow the official character sheet. That was my way of marking down all her ranks in dodge focus. I bought 8 ranks in defense though, so I figured that was the way to mark it. I can post with my usual sheet for defense if that helps. 2. I would have to assume so. I've always been a little unsure about if power feats apply to AP, but seeing as it wouldn't change the cost any, I'll say yes. If you want to just show the ranks that you bought that's fine. It's the "flat-footed" note that was throwing me off. Power Feats bought on the main power don't apply to any of the APs, but Power Feats (excluding the Alt Power feats) bought on the main power do increase the available PPs to spend on the other array slots. So you can buy those two feats on Dazzle if you want . . . or two different power feats. It's up to you, because as you said, it won't change the cost. Assuming you aren't going to make any changes . . . Approved. Cool. I edited my top post about the improved range.incurable for the dazzle. Seemed cleaner then posting it again. So I'm set to go with this one. Great! As soon as another Ref approves, you can get started playing.